Use your handicap to establish an equitable playing field in your next match. With a certified handicap, you can theoretically go head-to-head with the world’s best golfers and have a chance to win a match – once the handicap is factored into the score. But even if Tiger Woods, Phil Mickelson or Luke Donald don’t show up at your club, you can use your handicap to level the playing field in a variety of casual or competitive matches. 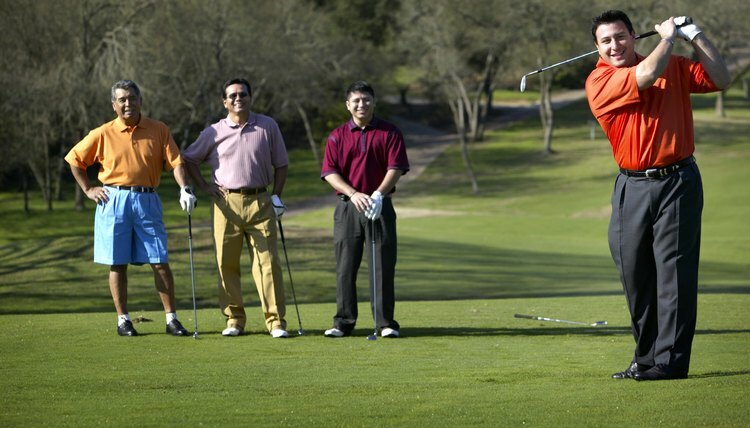 Join a golf club that’s licensed by the United States Golf Association to use its handicap system. If in doubt, ask the club's golf professional or a club officer if the club is USGA-certified. The club doesn't have to be located at a single, specific course. For example, the USGA's definition of a club includes groups whose "members are affiliated or known to one another via a business, fraternal, ethnic or social organization." Play at least five rounds of golf at courses with course and slope ratings, and post your scores with your club. Most clubs have a dedicated computer with a handicap service -- either the USGA's GHIN service or other registered service. Post your scores in the computer or on the score posting sheet, typically located in the locker room or on a bulletin board. Continue reporting your scores throughout the golf season to get the most accurate handicap index. Your index will be updated approximately every two weeks. Put your USGA-certified handicap index to use by converting it to your course handicap based on the difficulty of the course and the set of tees you play. Most courses post a conversion chart. Find your handicap index in the left column, and read across to the handicap column on the right. That number is your handicap. How do I Get a Fast Golf Handicap?